What is the easiest healthy breakfast ever????? Just four ingredients, something really tasty, easy to make, and can be frozen and reheated in a pinch. Those are my criteria at least! I think the last one on that list is a mom thing ? I’m so excited to share with you the breakfast that has gotten us through many mornings – and I always feel good about my kids eating it, even if we heat one up as a snack later in the day. I like to make a batch for a week or so, and use them when we have rushed mornings. Convenience is often the path to unhealthiness! But it doesn’t have to be….it just takes a pinch of preparation. The best part is that you can take this recipe as a “blue print” and make it your own, using the ingredients you have on hand. Don’t have salsa? Use fresh chopped baby tomatoes. Want to switch out the cheese? Perfect. Add chopped green onion or avocado? I would do it. I showed this on my Facebook LIVE channel, so you could see how to make two different versions: a salsa & cheese version, and a spring asparagus, ham and Swiss version. Honor loves the one with the salsa, and Aniyah loves the ham & cheese (I of course, love the one with the asparagus). If you make these, I would love to know how you like them! Please leave a comment below. I created this recipe for Albertsons Safeway. 2.In a medium bowl, whisk eggs and cottage cheese until well blended. 3.Spray a 12 cup muffin tray with nonstick cooking spray. Pour egg mixture equally between each cup. 5.Put back into oven for about 10 – 12 minutes. Eggs should puff up and cheese will be melted and slightly toasted. 6.Remove from oven, and let cool. Eat or freeze in a zip-lock bag for later! Reheat for an easy breakfast. Love the egg cup recipe for I get grandchildren breakfast and on the bus. Leigh Ann, that’s awesome! That’s how we usually eat them too – on the go:) Breakfast is equally as important whether you’re sitting down a the table, or running errands in the car – both can be quality time! What would you suggest if you did this recipe without the dairy ingredients and added veggies like spinach, peppers, and onion? Yes, you can leave out the dairy! It will be less tender & creamy w/o the cottage cheese (which is fine), and I often make them for myself without the added cheese on top. You could sautéed onions, mushrooms and spinach first and then add those to the cups, pour the beaten eggs over, and bake. 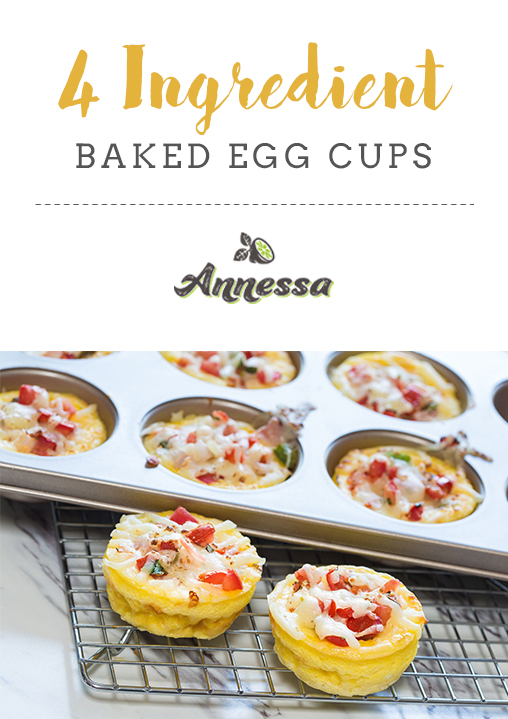 Or you could add shredded chicken and diced tomatoes to the cups and then pour beaten eggs over, etc. I think a load of veggies sounds amazing! Even broccoli, kale….it might be good to saute those first. I hope that helps!